"Wherever they are, they always sit right next to each other so that they’re touching." It was the worst case of neglect rescuers at NorCal Bully Breed Rescue had ever seen. 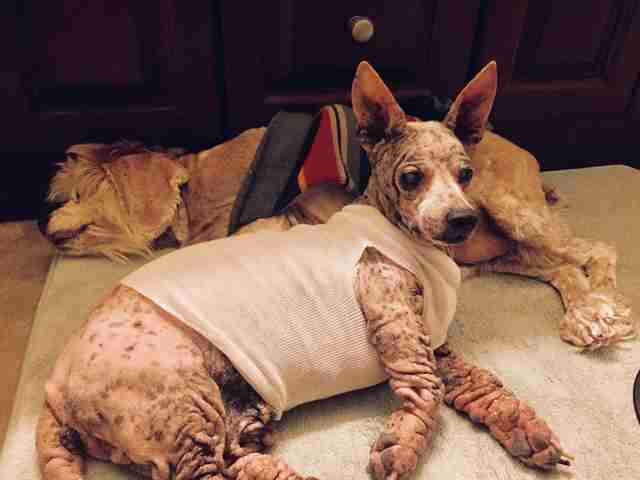 Infested by fleas and ridden with untreated skin infections, Chase the Chihuahua and his cocker spaniel companion, Buddy, could barely stand up due to the pain. 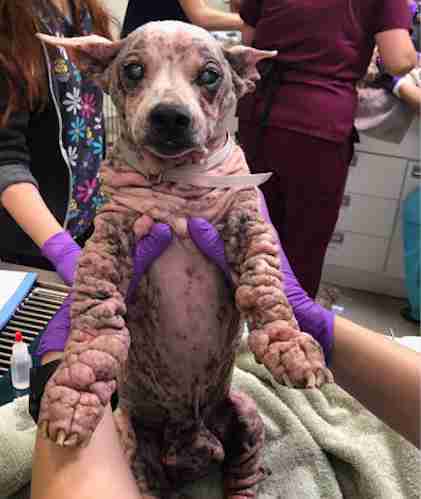 After years of being kept inside a house with little attention or care, Chase had lost all of his fur and was living with skin so red and swollen that he didn’t even resemble a dog. Buddy’s fur was deeply matted and caked with years-old urine and feces, which caused sores on his body. They were both blind and almost completely deaf. Still, the 12-year-old friends had each other. Buddy and Chase were surrendered to a Martinez, California, shelter in late October because their owner was moving. 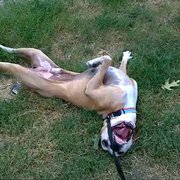 Since they would likely be euthanized at the public shelter, the dogs were transferred to a foster home through NorCal Bully Breed Rescue. Rescuers instantly started treating the dogs’ various health conditions, from their fleas and skin infections to intestinal parasites and overgrown nails. They’re also helping them recover from nutritional deficiencies from years of being fed a low-grade diet. Despite the odds stacked against them, Chase and Buddy’s foster mom, Kellie Murphy, told The Dodo they have nothing but love for people. Chase was also diagnosed with lymphoma, which he’ll be treated for over the next six months. But in the short time they’ve been in Murphy’s care, the dogs have already started getting stronger each day. 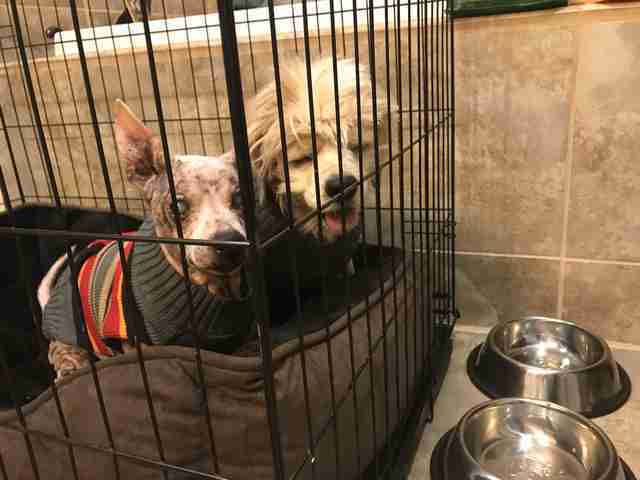 For now, the two senior friends are living comfortably with Murphy’s family, including her husband, 2-year-old daughter and their Chihuahua-daschund mix. New sweaters, warm beds and a yard to explore are a welcome change for them — but still, even in the safety of their new home, they don’t wander too far from one another. Meanwhile, local law enforcement is conducting an ongoing animal cruelty investigation of the dogs’ original owner. To support the ongoing medical care of Chase and Buddy, you can make a donation to NorCal Bully Breed Rescue.